Frugal Replacements to Disposable Products. Disposable items have become a major part of everyday life. So much so, that we often don’t stop to think how much we’re spending on them, or how much they’re contributing to landfills. Luckily, many of them can be easily replaced by much longer lasting, and inexpensive, versions. Some you can make yourself, and others you may need to purchase. But either way, you’ll save a lot of money in the long run, and do something good for the environment while you’re at it! Check out all these Disposable Products You Can Replace with Reusable Ones! Even reducing one or two disposable products will go a long way to helping your budget and the environment! 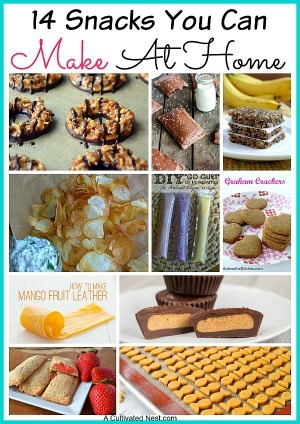 Check out these great ideas! Have you ever stopped to think how many paper towels you use in a year? 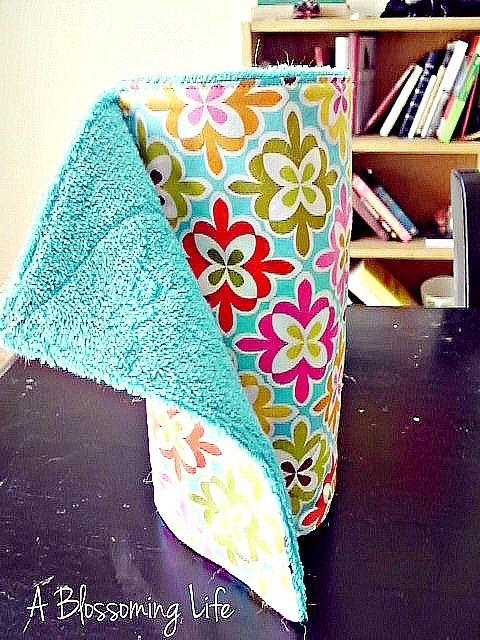 Why keep buying and throwing away paper towels when you can easily make your own “unpaper” towels! The unpaper towels in this tutorial from A Blossoming Life can be Velcroed together, so you can roll them up like traditional paper towels. Or switch to using rags. You can also find bamboo-based washable and reusable “paper” towels on Amazon. If you’re using paper napkins for every meal, then that’s a lot of napkins winding up in the trash. Instead, make or buy cloth napkins! You could even monogram or otherwise customize napkins for the different members of your family. Chocolate And Zucchini has a great tutorial on how to make some really pretty homemade cloth napkins. You can also find tons of pretty cloth napkins on Etsy. If you wear makeup, then you’re probably a fan of makeup remover wipes. But have you ever thought about how many of those you throw away? Or what’s in those wipes? An eco-friendly solution would be this reusable makeup eraser cloth. It’s chemical free, so it’s good for you and the environment! Commercial cleaning wipes are very handy, but their cost can add up, and they’re made with lots of chemicals. Instead, make your own with old towels, upcycled shirts, etc. 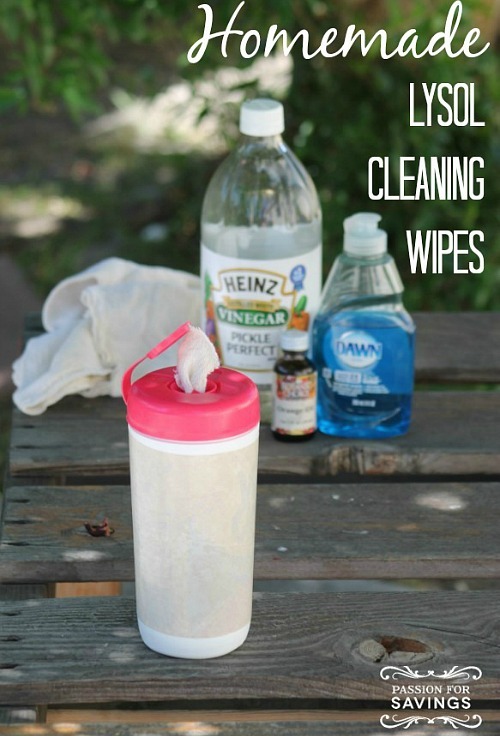 Passion for Savings shows how to make homemade cleaning wipes with just a few safe ingredients. It’s so easy to just stick a sandwich in one of the commercial plastic sandwich bags. But if you’re packing sandwiches often, you may want to consider switching to a fabric sandwich bag instead. Just pack, eat, wash, and reuse. They’re pretty easy to make, too, as you can see in this DIY sandwich bag tutorial from Chica and Jo. Or you can buy pre-made reusable sandwich bags on Amazon. I love to bake, but I do feel a little guilty every time I have to toss parchment paper from a baking session in the trash. The solution- silicone baking mats! They work just like parchment paper, but are reusable! Plus, if you use them you don’t have to spray your pan with oil before you bake, making your homemade desserts a little bit healthier. 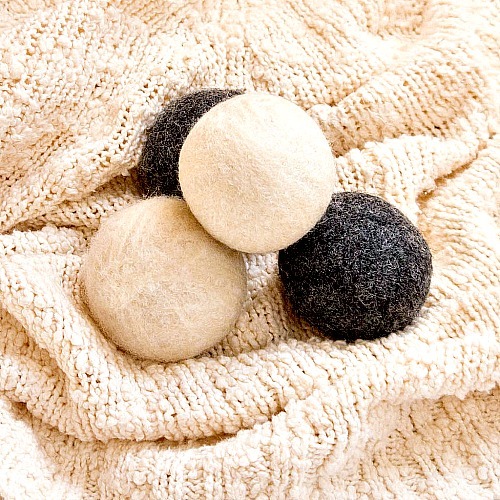 If you use fabric softener or dryer sheets, a cheaper and healthier alternative would be to use wool dryer balls like these from Pop Sugar. Or you could make some aluminum foil dryer balls (we’ve done this and it worked well). It only takes a few minutes to make foil dryer balls if you follow the tutorial by Creek Line House. Or if you don’t have the time for any of that, just buy some wool dryer balls on Amazon! Tissues are another thing that you don’t think about, but that you use hundreds of each year (a single box holds 100+ tissues). So how about using handkerchiefs instead? You could even make your own, in any style or color you want. 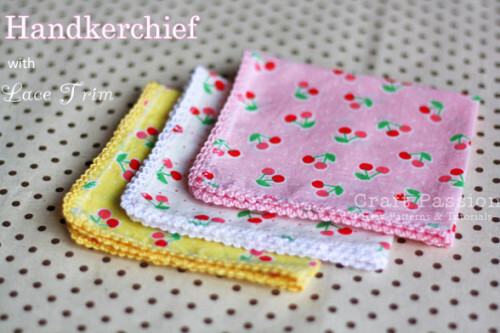 The lace trim handkerchiefs in Craft Passion’s handkerchief tutorial are really cute! Not great at sewing? 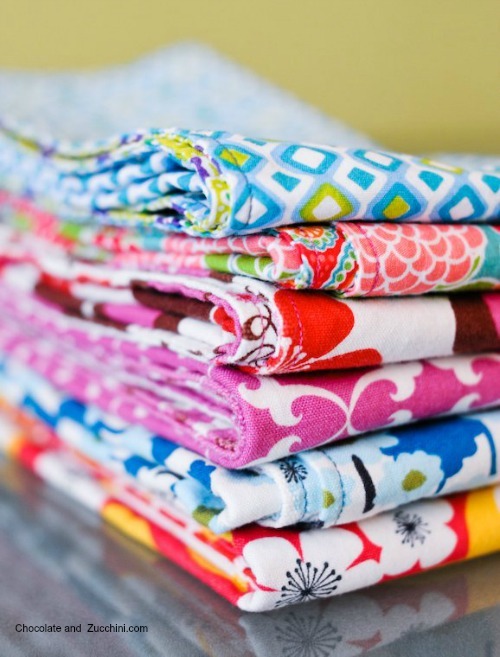 Tons of creatives have beautiful handmade handkerchiefs for sale on Etsy! We use straws frequently for smoothies in my family. If your family also often uses straws, you may want to consider getting stainless steel straws . What’s great about them is that you can clean them and reuse them for years. Brands like Swiffer make their money off of the fact that you have to continuously replace the dusters on their products. Instead of doing that, save some money by making or buying reusable dusters. You can buy some really pretty reusable dusters on Etsy. 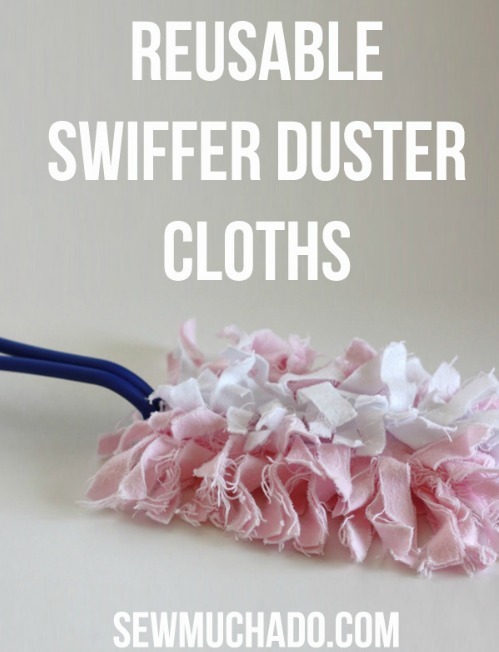 Or you can make your own duster for your Swiffer handle by following Sew Much Ado’s easy tutorial. Commercial disposable bowl covers tend to look like plastic shower caps, but they get the job done. But why use those when you could make your own bowl/food covers that look prettier and that are reusable? 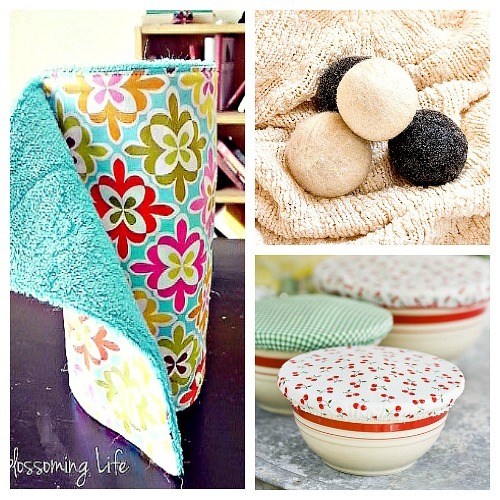 You can easily sew your own bowl cover by following the Farm Chicks’ great tutorial! 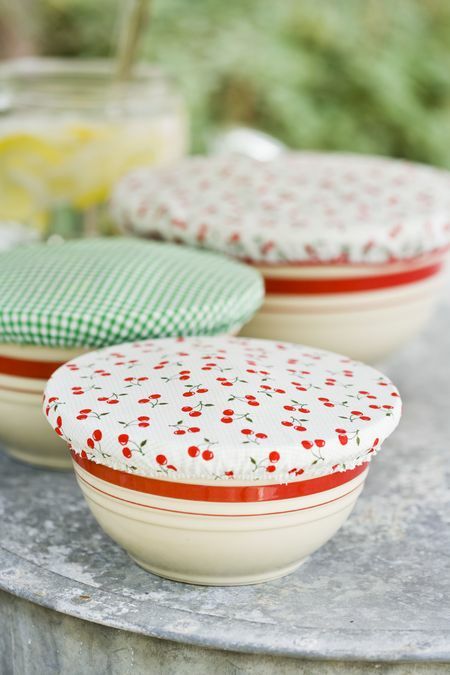 And if you’re tight on time, you can buy some pretty reusable bowl covers on Amazon. Buying bottled water can be bad for a number of reasons. The bottles can contain BPA, they contribute to landfills, and the water may be of the same quality as your home tap water. So instead of paying for another 24 pack of plastic, consider buying bottles that you can refill and wash. My daughter loves her BPA-free plastic Thermos water bottle , and we also use aluminum SIGG bottles. As you can see, it’s easy to replace the disposable products in your life with reusable ones. Not only is it better for the environment and your budget, but you can often make or buy ones that look much prettier! Have you replaced any disposable products with something reusable? These are so many great ideas here – I’m going to make the non-paper towels, non-paper napkins, and hankies. What a money saver! Thanks for sharing. We have used cloth napkins throughout our nearly 44 years of marriage. It has taken us a little longer to reach for a dishtowel instead of a paper towel. I bought 10 dishtowels at IKEA for 79 cents each and can’t believe how much we use those cloths towels. I need to make an IKEA run soon. I started using vinegar in my rinse water a couple years ago. It works almost as good as Downy and since my daughter bought me a good supply of Charlie’s Soap as a gift before Christmas, laundry costs almost nothing (well, the hot water for heavy duty loads). I do usually keep liquid Downy for one type of clothing, when I wash sweaters that do not need to be drycleaned. I find it helps to soften them! I’m forwarding this to a friend who loves to sew. So many other good ideas. Hi, Manuela! 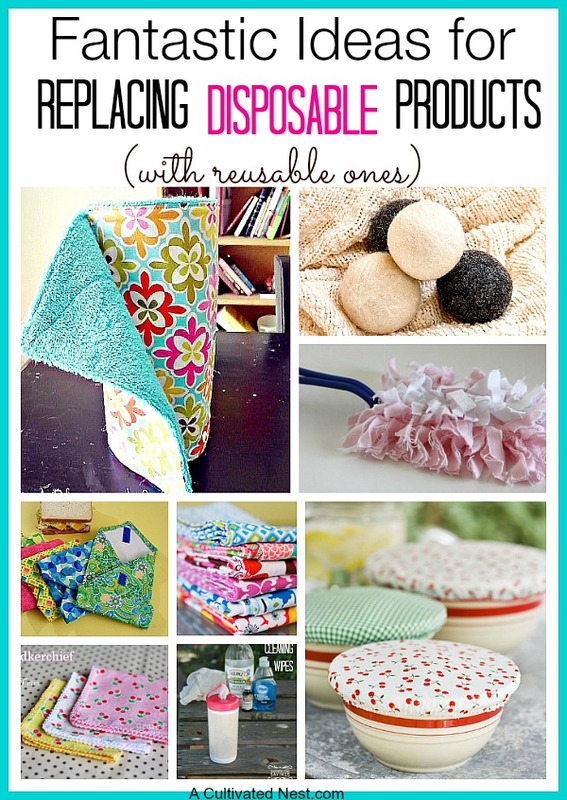 Awesome post and thank you for your efforts to spread the word about reusable products. Certainly something I am passionate about. Get in touch with us at Hummingbird Glass Straws if you would like to try out our reusable glass straws. They are beautiful and won’t add any strange tastes to your drinks like metal straws can. I think you’ll love them! Fabulous ideas! I love the darling paper towels and I love hankies, so that would be so fun! I am so with you on all these ideas and have already incorporated a lot of them into our life. We use cloth napkins; use rags (old, cut up tshirts) for cleaning; use stainless steel water bottles; gave up the toxic cleaning wipes; etc. I need to make some of those wool dryer balls…I don’t use fabric softener (more chemicals and not good for your clothes) but my laundry is so static-y when it comes out of the dryer. I’ve tried using vinegar in my rinse water and that doesn’t work either. We’ve used the foil balls and that seems to help some with the static – give that one a try since it’s easy to make those. Love all these ideas, definitely some things here that I have thought about doing for a long time, and not got around to! Hanging your washing on the line is ‘zero waste’ instead of using a dryer. Buy metal recyclable pegs and it becomes the most environmentally friendly option. 1 Separate your natural fabric items from synthetic fabric items. You can wash them together then dry separately. If the fabric is mixed (a cotton/poly blend for example), do it with the synthetics. This eliminates the static on natural fabrics, but doesn’t help the synthetics. 2 Don’t use the dryer. Dry outdoors on a line, or on a hanger on the shower curtain rod. I do all blouses this way. If you give them a few sharp shakes before putting them on the hanger you won’t have wrinkles either. 3 If you use the dryer, don’t let them get too dry. You can pull out the shirts and blouses when they are very nearly dry and hang them, then let the jeans, towels, etc. go longer. Thank you for all the wonderful ideas and tips too! I will be making many items for my home as well as my grown children’s homes. While I’ll never give up my paper towels entirely, I’m on a mission to reduce my usage dramatically. Towards that end, I ordered 60 Bed Bath and Beyond quick dry microfiber cleaning rags (regularly $4.99 for a package of 30 or $3.99 with my Beyond account) and a ten-pack of microfiber cleaning towels ($9.99/$7.99.) Later on I came across a Costco offer: 36 extra-plush microfiber towels, slightly larger than the ones from BB&B, $17.99 the package. I am loaded for bear!! One unexpected bonus, I was surprised at how much better microfiber works than paper towels. One swipe with a microfiber cloth and, for instance, glass cleaner = three passes with a handful of paper towels and additional cleaning product. These are all best washed in warm water and either air dried or machine dried on low, so I’m putting the used cloths and towels in a separate laundry bag and laundering them all at the same time. Now all I have to do is find a workable replacement for my Swiffer Wet floor cleaner, which I loathe with an all encompassing hatred. Clumsy AND ineffective. Good job Mandy! I just use a regular mop and bucket (I do have a steamer that I also use once in a while). I know you can make your own Swiffer Wet floor cleaner liquid.